McFarlane Toys spent last weekend at the Sportcard and Memorabilia Expo in Mississauga, Ontario, Canada, and was honored by the presence of two members of the Hockey Hall of Fame. 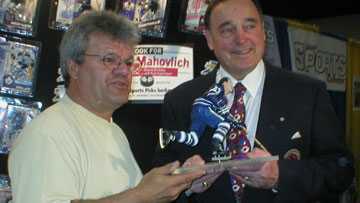 Marcel Dionne and Frank Mahovlich helped "lift the curtain" on our upcoming NHL Legends line of action figures. Mahovlich looked over the "2-up" prototype for his upcoming figure and even signed off on it -- autographing the base it stands on. His figure will be part of the first series of hockey legends, due in stores this September. The debut series will also include Yvan Cournoyer, Gerry Cheevers and two different Wayne Gretzky figures. The Mahovlich figure was pushed to the front of our production line in order to be ready for display at the Expo. Look for detailed photos of the other figures in the coming weeks here on spawn.com. Thanks to all our fans who came out to the event. Click here for all the details on this line.